Diamond & Sapphire Heart Necklaces, Rings & Bracelets. Jewelry Gifts Of Love Between Mothers & Daughters. Secure Shopping, Only US Shipping. Your mom is always there to encourage, guide and comfort you. Her love is a precious gift you carry with you wherever you go. Now, give Mom an enduring reminder of your love with this diamond pendant necklace expressing the timeless bond you share. An exclusive fine jewelry design from The Bradford Exchange, the I Love You Mom pendant sparkles with a ribbon of 3 genuine diamonds in a glittering pave setting, symbolizing your love today, tomorrow and always! An elegant and heartfelt way to say "I Love You Mom", this heart-shaped pendant necklace is handcrafted of solid sterling silver for lasting beauty. The unique design features a matching sterling silver chain that runs under the diamonds and reappears on the other side of the heart. For the finishing touch, the heartfelt sentiment "Mom, I love you today, tomorrow and always" is engraved in elegant script on the back. A memorable gift for Mom, this diamond pendant necklace arrives in a velvet jewelry pouch and gift box. Hurry, eager demand is expected. Order now! You never know how much love your heart can hold until someone calls you Mom. Now you can celebrate each and every loving blessing of motherhood with this beautiful personalized mom birthstone ring. Showcasing an original fine jewelry design only from The Bradford Exchange, the Mom's Blessings Personalized Ring is the perfect way to honor your own children or give as a special gift to your mother. And the best part of this personalized mom ring is that you can select up to 10 crystal birthstones to be featured in the ring's distinctive design, to symbolize those who mean the most to you. Superbly handcrafted of solid sterling silver, the Mom's Blessings ring showcases a sculpted, 18K gold-plated "MOM" right in the center, embraced on either side with your chosen birthstones. Beyond the rows of birthstones are flowing cascades of pave-set clear crystals for a stunning complement, and the perfect finishing touch is the engraving of "My Family Forever" inside the band. Strong demand is expected for this mom birthstone ring, so don't wait to personalize yours. Order now! The bond between a mother and her children is like no other, and now this sterling silver heart-shaped birthstone pendant necklace provides a uniquely beautiful way for Mom to keep the ones she loves close to her heart! Available exclusively from The Bradford Exchange, it's the perfect personalized gift for Mom to show off her pride and joy! This exquisite exclusive jewelry design is crafted of solid sterling silver. A brilliant-cut diamond sparkles at the top of the heart, and a touching sentiment is engraved on the back. There's even a matching 18" sterling silver chain. But this stunning pendant's most unique features are the solid sterling silver heart charms that rest between two clear glass inlays, creating a special window to what a Mom truly holds in her heart! You may specify up to 8 charms, each one set with the genuine birthstone of your choice, creating a work of custom-made jewelry, individually handcrafted for you. This is truly the ideal personalized gift for Mom, but don't delay! Strong demand is expected, so order now! As a mother, family is the center of your universe, with each member bringing you loving rewards daily. Now you can express just how much you love them, and keep them always close, with the Mom's Pride and Joy Personalized Bracelet, a fine jewelry design only from The Bradford Exchange. The most unique part of this stylish bracelet is that it is personalized with up to 6 Swarovski® crystal birthstones and 6 names engraved on 18K gold-plated beads, for a gleaming one-of-a-kind tribute to your beloved family! This exquisite personalized bracelet for Mom is finely handcrafted of stretch stainless steel mesh for a supremely comfortable fit. Joining your name-engraved 18 K gold-plated beads are 6 sterling silver-plated beads with rows of birthstone-set hearts to symbolize your family members. A final bead displays a sterling silver-plated heart charm accented in 18K-gold plating and engraved with "My Family My Joy", for a total of 13 distinctive beads. Arriving in a velvet jewelry pouch and a custom gift box, Mom's Pride and Joy Personalized Bracelet delivers a meaningful statement for you, or as a gift. Strong demand is anticipated, so don't delay. Order now! Tell your daughter heartfelt words she'll remember forever - she'll never be alone with God in her life. Inspired by the beloved poem, The Bradford Exchange is pleased to present this beautiful Footprints in the Sand jewelry, our exclusive You'll Never Walk Alone Pendant Necklace. This fine jewelry design is intricately handcrafted in solid sterling silver with 18K gold-plated accents and features two linked open hearts, symbolizing that God is always by your daughter's side. Footprints, plated in 18K gold, decorate one side of each heart, while shimmering Diamonesk® simulated diamonds are set along the other side. Our exclusive Diamonesk diamonds sparkle with the fire and brilliance of the finest gemstones - but at a fraction of the cost. The reverse side of the larger heart is finely engraved with the inspirational message "Dear Daughter, You'll Never Walk Alone" along with a cross. An 18-inch solid sterling silver chain glides through a hidden bail to complete the beautiful look of this Diamonesk daughter pendant. A message of faith and gift of love for your daughter, this lovely pendant necklace will surely become a keepsake she'll treasure forever. The pendant arrives in a velvet jewelry pouch and gift box, perfect for safekeeping and gift giving. Strong demand is expected. Order now! You love your daughter beyond compare. It's endless and timeless and forever. Now, you can give her a reminder of the heartfelt bond the two of you share with the striking My Precious Daughter Diamond Pendant Necklace, a fine jewelry design exclusively from The Bradford Exchange. A keepsake your daughter is sure to treasure, this stunning engraved necklace features the loving message, "My Precious Daughter, I Love You Today, Tomorrow and Always". Exquisitely designed and finely handcrafted to create jewelry worthy of your daughter, this diamond necklace showcases a solid sterling silver sculpted heart plated in 18K gold. Flowing down the center of the heart is a sparkling ribbon of 3 genuine diamonds in a pave setting, representing today, tomorrow and always. A matching 18K gold-plated chain runs under the glittering ribbon of diamonds, reappearing behind the heart on the other side in a uniquely beautiful design. This meaningful diamond necklace is sure to delight your daughter, but strong demand is expected. Order now! The moment you laid eyes on your beautiful daughter, your heart filled with wishes for a future filled with love, joy, hope and more. Now, let her wear a heartfelt message of your love wherever she goes with the Wishes for My Daughter Personalized Crystal Bracelet, a fine jewelry exclusive from The Bradford Exchange. For an extra special touch, you may choose to have her name engraved for FREE on the delicate heart charm to serve as a beautiful reminder of how much your daughter means to you every time she wears this stunning bracelet. Exquisitely handcrafted and plated in sterling silver, this personalized bracelet for daughters features six uniquely colored crystals set between elegant wave-shaped links, each engraved with a wish for your daughter - Love, Joy, Hope, Faith, Beauty and Peace. This beautiful bracelet arrives in a velvet jewelry pouch and gift box along with a touching poem, "My Precious Daughter, I Wish You", making this a perfect gift for daughters. Strong demand is anticipated, so don't delay. Order now! Give your daughter an exquisite reminder of the special love between you. She'll fall in love with this engraved daughter jewelry gift featuring an elegantly handcrafted solid sterling silver heart-shaped diamond pendant. A glittering ribbon of 3 genuine diamonds in a pave setting flows down the center of the heart symbolizing: today, tomorrow and always. As seen on Lifetime Television's "The Balancing Act". A decorative sterling silver chain runs under the diamonds, reappearing on the other side of the heart for a distinctive design. The back of the heart is engraved with the loving sentiment: "My precious Daughter, I love you today, tomorrow and always". This fine jewelry exclusive from The Bradford Exchange is perfect for every day or dressy occasions. Arrives in a velvet jewelry pouch and gift box, ready for gift-giving. Strong demand is expected. Order now! A love for a special daughter is much like a precious package tied with a ribbon and bow. This stunning pendant necklace for daughters is a reminder of a love that truly is a gift! A genuine solitaire diamond adds the sparkle of beauty and value to this heartfelt mother daughter jewelry gift. Give her a lovely, beribboned box that can be held close to her heart with this gorgeous diamond pendant necklace for daughters, a fine jewelry design available exclusively from The Bradford Exchange. Handcrafted in solid sterling silver and accented with 24K gold, the pendant necklace arrives in a lovely gift box that holds a touching poem card. Makes a treasured jewelry gift for daughter. Heavy demand is expected, and you won't want to miss out. Order now! Pearls - fashionable, elegant, timeless, yet filled with mystic beauty! In mythology the pearl is considered a powerful jewel associated with both the moon and water, and is said to inspire truth, wisdom and a sense of calm. They're even lucky when worn with diamonds - as in this stunning diamond and freshwater cultured black pearl pendant necklace, a fine jewelry design exclusively from The Bradford Exchange.Exquisitely crafted from solid sterling silver, this striking pendant necklace is custom designed in a graceful teardrop shape. Eight black diamonds and three white diamonds are set in a swirling pave to create a dramatic contrast that sparkles like moonlight on water. Best of all, the pave wraps sinuously around a genuine freshwater cultured black pearl that radiates a mysterious luster. For yourself or as a gift for someone special, this dramatic black pearl jewelry is the perfect expression of elegant style, but strong demand is expected - order now! The love a mother has for her precious daughter reaches beyond the heavens above! Now you can tell her exactly how you feel with the I Love You to the Moon and Back Daughter Diamond Pendant Necklace, a fine jewelry design exclusively from The Bradford Exchange. Beautifully handcrafted in solid sterling silver, this daughter diamond pendant is designed in a unique shape to look like a delicate sliver of the moon. The moon-shaped pendant features a shimmering combination of a textured pave design with a beaded border and a gleaming inside edge. Gracefully suspending from the tip of the moon is a lovely open heart that holds a sparkling solitaire diamond at its center. The reverse side of the moon is elegantly engraved with the touching message "Daughter, I Love You to the Moon and Back". The daughter diamond pendant suspends from a matching 18" sterling silver chain. 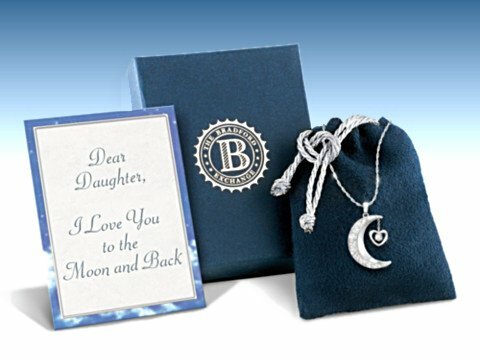 Your I Love You to the Moon and Back Daughter Diamond Pendant Necklace arrives in a velvet jewelry pouch and gift box accompanied by a touching poem card expressing your love. Strong demand is expected. Order now! The day she was born, your life changed forever. Your darling daughter brings more joy to each day than you could have ever imagined. Now, you can give her an everlasting reminder of your love for her with this gleaming crystal heart pendant custom crafted with her crystal birthstone, a fine jewelry design exclusively from The Bradford Exchange. Brimming with glimmer, this is a daughter gift you won't want to miss out on!This Always in My Heart daughter necklace features a beautifully faceted heart of the clearest crystal. Embedded inside the crystal is your daughter's heart-shaped crystal birthstone, which seems to float in the center of the pendant creating a stunning heart-within-a-heart design. A shimmering solid sterling silver chain adds the perfect finishing touch. Plus, this striking crystal jewelry arrives in a velvet jeweler's pouch and gift box, perfect for safekeeping and to give as a great gift to your precious daughter, but high demand is expected. Order now! Remind your dear daughter of her place in your heart - deliver a special message of love with this engraved daughter locket necklace, exclusively from The Bradford Exchange. Uniquely handcrafted in the shape of a letter, the locket opens to a heartfelt message engraved with the words, "I was never so blessed as the day you were born. I love you!" Handcrafted in shimmering solid sterling silver, the locket sparkles with 2 hand-set faceted diamonds and is richly accented with 2 gleaming 24K gold-plated hearts. Send a special delivery to your "first-class" daughter and imagine her surprise when she finds your message inside. Strong demand is expected for this engraved gift for daughter. Order now! A daughter is a precious blessing who is surrounded by love and the faith that guides her way. 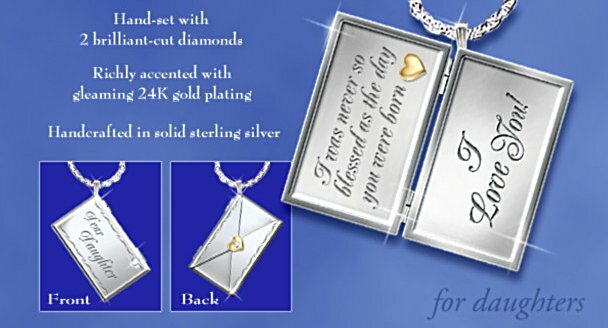 Now you can give your daughter a shining expression of your ever-present love and let her know that God will always be there for her with this Light of Faith daughter diamond pendant necklace, a fine jewelry design exclusively from The Bradford Exchange. Exquisitely crafted in solid sterling silver, this daughter diamond pendant features a stunning two-toned star of silver and 18K gold plating. What a beautiful reflection of love and faith!The silver points of the star form a cross, which sparkles with a genuine solitaire diamond at its center. Surrounding the points of the star is a shimmering circle of silver that features a highly polished diamond-cut design, creating a mirrored effect. The daughter pendant suspends from an 18" solid sterling silver chain. 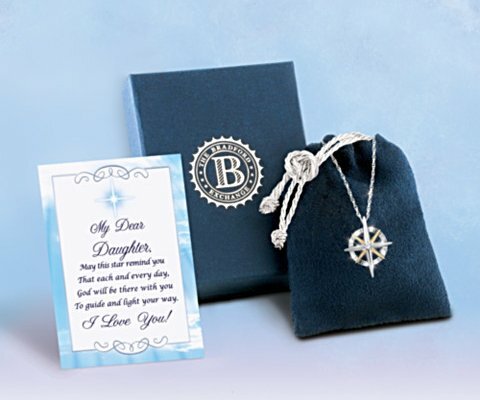 Your Light of Faith daughter diamond pendant necklace arrives in a velvet jewelry pouch and gift box accompanied by a touching sentiment card expressing your love for your dear daughter. Strong demand is expected. Order now! Your beautiful daughter fills your heart with endless love. She's the light of your life and you cherish her every single day. Now, you can show your precious daughter how special she is with the sparkling Forever My Daughter Diamond Pendant Necklace, a fine jewelry exclusively from The Bradford Exchange. This shimmering necklace even arrives with a custom presentation case and touching sentiment card!This striking heirloom quality necklace is exquisitely handcrafted in solid sterling silver and features a heart-shaped bail that gracefully twists into a symbolic infinity design for a stunning representation of a mother's forever love for her daughter. The dazzling twisting strand showcases 12 genuine diamonds. Plus, the reverse side of the pendant is elegantly engraved with the tender sentiment, "I love you forever." Strong demand is expected for this meaningful necklace, so order now!